What if Constantine was defeated by Maxentius at the Milvian Bridge, and his body drowned in Tiber? The Roman army that Constantine had inherited from his father was evidently not very confident about the campaign, nor thrilled having to fight under the Christian Cross. Constantine’s advisers and generals cautioned against attack on Maxentius, even his soothsayers recommended against it, stating that the sacrifices had produced unfavourable omens. 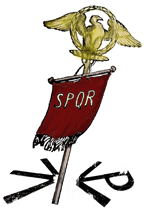 Maxentius had superior position and superior force. Constantine ignored all these cautions and showed a spirit that left a deep impression on all his followers, inspiring some to believe that he really had some form of supernatural protection. In Rome, Maxentius too had evoked supernatural guidance. He had consulted the Sibylline Oracles; sacrifices had been offered to Juppiter Optimus Maximus. On the crucial day in October, 312 CE Maxentius wavered. Should he advance out of Rome and confront his enemy face to face? Or stay behind the impenetrable Aurelian Walls? Maxentius marched out in force all the way to Saxa Rubra, but then his courage failed and he made a quick withdrawal as soon as Constantine’s cavalry was in sight. Even the pontoon bridge he had set up was left behind intact. Constantine saw his enemy in rout, pressed on, and fell into a trap. The pontoon bridge collapsed as soon as his advance guard had crossed it, effectively splitting his forces in two. Constantine’s cataphracts made a stubborn stand on the southern bank of Tiber against Maxentius’ Praetorian guardsmen, but in the end, they were cut to pieces. Constantine himself was among the dead, having been thrown by his horse into the river. Constantine’s name was added to the long list of Roman usurpers. With the resources of the Western Empire now in his possession, Maxentius could crush his only remaining rival, Licinius, between him and his ally, Maximinus Daia, who was emperor in the East. Constantine’s ignominious fate reassured the belief that the old gods still protected Rome (if given proper deference), and Christianity was made a laughing-stock of a religion. Without Constantine, there would be no sudden change in the religious policy, no orthodoxy, no beautiful basilicas and most importantly, no Christian capital. Byzantium would never become New Christian Rome. During Maxentius’ long reign, state-supported pagan priesthoods continued to be commodiously cushioned by a substantial largesse. Money and tribute flowed once again to Rome, the Eternal City, which had been blatantly disregarded during the Tetrarchs. Maxentius adorned her with extensive public buildings on a scale not seen since the days of emperor Trajan. In later Roman Empire, there would be Christian emperors, but not even one who would dare to disrespect the pagan gods. When the two religious systems are finally accommodated to each other, it will be Jesus Christ who is adopted among the good philosophers and teachers, while pious emperors pray the Most High God of the Neoplatonists and offer incense to the Unconquerable Sun. Christian church, discredited and persecuted everywhere in the Empire, dissipates into xenophobic monasticism and quarrelsome sectarianism, never to allure the erudite and the wealthy.